Pernio is an inflammatory skin condition presenting after exposure to cold as pruritic and/or painful erythematous-to-violaceous acral lesions. Pernio may be idiopathic or secondary to an underlying disease. Note the image below. A 63-year-old man with pernio presenting as acral violaceous plaques with bullae. Pernio is due to an abnormal vascular response to cold exposure,  and it is most frequent when damp or humid conditions coincide. Minor trauma also may predispose the acral parts to symptomatic pernio lesions in otherwise appropriate weather conditions. Hyperhidrosis and low lody mass index are suggested associations. The response of pernio to vasodilator drugs varies. Keeping acral areas warm and dry best prevents pernio. Kibes (equestrian cold panniculitis): Erythrocyanotic plaques occur on the upper lateral thighs of women who ride horses. Histology is characterized by an intense perivascular infiltrate extending into subcutaneous fat. Chilblain lupus erythematosus [10, 11] : Violaceous "pernio" plaques appear prominent over dorsal interphalangeal joints, often with positive antinuclear antibody (ANA) or rheumatoid factor (RF). Histologic and immunofluorescent evidence of lupus is present in the skin lesions. Half of the patients have associated facial discoid lupus lesions, and 15% develop systemic lupus. The true incidence of pernio is unknown because pernio frequently is unrecognized or misdiagnosed. Women are affected by pernio more frequently than men. Pernio is most frequent in young and middle-aged women and in children. Note the image below. Erythematous macules on distal toes of a 6-month-old girl with pernio. Prognosis is good. Recurrences may be observed annually with onset of cold weather. Long-term follow-up of patients with chronic recurrent pernio is advised because this may reveal connective-tissue disease (lupus erythematosus). Most cases of pernio resolve without any adverse reactions. Keep extremities warm and dry. Shahi V, Wetter DA, Cappel JA, Davis MD, Spittell PC. Vasospasm Is a Consistent Finding in Pernio (Chilblains) and a Possible Clue to Pathogenesis. Dermatology. 2015 Sep. 231 (3):274-9. [Medline]. Singh GK, Datta A, Grewal RS, Suresh MS, Vaishampayan SS. Pattern of chilblains in a high altitude region of Ladakh, India. Med J Armed Forces India. 2015 Jul. 71 (3):265-9. [Medline]. Prakash S, Weisman MH. Idiopathic chilblains. Am J Med. 2009 Dec. 122(12):1152-5. [Medline]. Almahameed A, Pinto DS. Pernio (chilblains). Curr Treat Options Cardiovasc Med. 2008 Apr. 10(2):128-35. [Medline]. Kelly JW, Dowling JP. Pernio. A possible association with chronic myelomonocytic leukemia. Arch Dermatol. 1985 Aug. 121(8):1048-52. [Medline]. White KP, Rothe MJ, Milanese A, Grant-Kels JM. Perniosis in association with anorexia nervosa. Pediatr Dermatol. 1994 Mar. 11(1):1-5. [Medline]. Akkurt ZM, Ucmak D, Yildiz K, Yürüker SK, Celik HÖ. Chilblains in Turkey: a case-control study. An Bras Dermatol. 2014 Jan-Feb. 89 (1):44-50. [Medline]. Rustin MH, Foreman JC, Dowd PM. Anorexia nervosa associated with acromegaloid features, onset of acrocyanosis and Raynaud's phenomenon and worsening of chilblains. J R Soc Med. 1990 Aug. 83(8):495-6. [Medline]. Kearby R, Bowyer S, Scharrer J, Sharathkumar A. Case Report: Six-Year-old Girl With Recurrent Episodes of Blue Toes. Clin Pediatr (Phila). 2010 Jan 28. [Medline]. Su WP, Perniciaro C, Rogers RS 3rd, White JW Jr. Chilblain lupus erythematosus (lupus pernio): clinical review of the Mayo Clinic experience and proposal of diagnostic criteria. Cutis. 1994 Dec. 54(6):395-9. [Medline]. Viguier M, Pinquier L, Cavelier-Balloy B, et al. Clinical and histopathologic features and immunologic variables in patients with severe chilblains. A study of the relationship to lupus erythematosus. Medicine (Baltimore). 2001 May. 80(3):180-8. [Medline]. Reinertsen JL. Unusual pernio-like reaction to sulindac. Arthritis Rheum. 1981 Sep. 24(9):1215. [Medline]. Chan Y, Tang WY, Lam WY, et al. A cluster of chilblains in Hong Kong. Hong Kong Med J. 2008 Jun. 14(3):185-91. [Medline]. Langtry JA, Diffey BL. A double-blind study of ultraviolet phototherapy in the prophylaxis of chilblains. Acta Derm Venereol. 1989. 69(4):320-2. [Medline]. Verma P. Topical Nitroglycerine in Perniosis/Chilblains. Skinmed. 2015 May-Jun. 13 (3):176-7. [Medline]. Dowd PM, Rustin MH, Lanigan S. Nifedipine in the treatment of chilblains. Br Med J (Clin Res Ed). 1986 Oct 11. 293(6552):923-4. [Medline]. Rustin MH, Newton JA, Smith NP, Dowd PM. 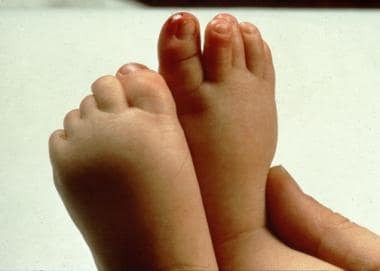 The treatment of chilblains with nifedipine: the results of a pilot study, a double-blind placebo-controlled randomized study and a long-term open trial. Br J Dermatol. 1989 Feb. 120(2):267-75. [Medline]. Close-up of erythematous macules and plaques on distal plantar toes. Close-up of great toe bulla. Disclosure: Serve(d) as a director, officer, partner, employee, advisor, consultant or trustee for: University of Alabama at Birmingham; University of Alabama Health Services Foundation<br/>Serve(d) as a speaker or a member of a speakers bureau for: Ferndale Laboratories<br/>Received research grant from: NIH, Veterans Administration, California Grape Assn<br/>Received consulting fee from Astellas for review panel membership; Received salary from Massachusetts Medical Society for employment; Received salary from UpToDate for employment. for: Astellas.